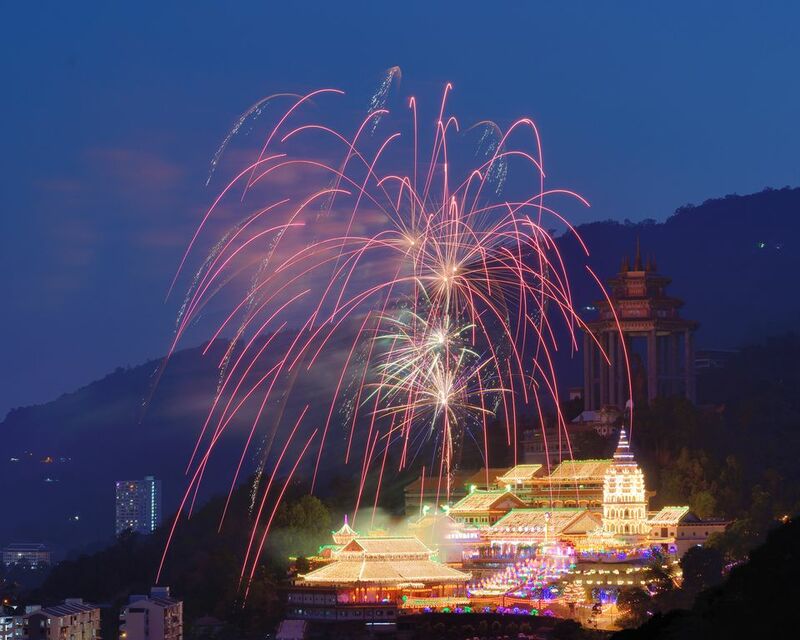 Thanks to its sizable Chinese population, Chinese New Year in Penang is especially boisterous. On the eve of the New Year, Malaysian Chinese turn up in their ancestral homes to eat, gamble, and celebrate with their families. The Penang Chinese Clan Council (PCCC) will hold a Chinese New Year celebration on the streets of George Town Heritage District, particularly around the Penang Esplanade, Lebuh Light, Lebuh King, Lebuh Penang, Lebuh Gereja, Lebuh Bishop, Lebuh Pantai and Lebuh Armenian. Normally closed to all except their members and devotees, over 20 clan houses and temples within Penang's historical district will open their doors to visitors on February 9. If you want to see traditional Chinese performing arts, this is the place to go. Lion dances and Chingay performances will compete for your attention, just as you're sampling the delicious food that comes with any Chinese New Year celebration! Celebrations are expected to start at 4pm and end well after midnight. The Temple of Supreme Bliss on Air Itam, or Kek Lok Si Temple, is the site for some of the biggest festivities leading up to Chinese New Year. From February 4 to 19, more than 200,000 light bulbs and 10,000 lanterns will illuminate this century-old temple, shedding light on the Chinese New Year celebrations swirling around. The lights will turn on from 7pm to midnight, transforming this ancient temple into a gorgeous palace of light in the dark hours throughout Chinese New Year. For more on the temple, read our article: Introduction to Kek Lok Si Temple. From February 9 to 10, hot air balloons will rise over Padang Polo (location on Google Maps) in the mornings, rising with the cool sunrise breezes and blazing bright colors against the sky. Previous iterations of the Fiesta brought over 100,000 visitors to watch a motley group of 15 hot-air balloons take to the air, among them Darth Vader's head! Rides aboard the hot-air balloons are allowed, but only on special tethered balloons. Visit the official site for more details: penanghotairballoonfiesta.com. The Chinese deity Chor Soo Kong is the patron of Penang's Snake Temple. He is venerated as a guardian of wild snakes, and the temple has served as a refuge for countless snakes since its foundation in the 19th century. The incense smoke in the temple is believed to keep the snakes tame for visitors, but keep your distance just in case. The sixth day of the Chinese New Year is held to be the deity's birthday, and visitors come from far and wide to pay their respects. On the eve of Chor Soo Kong's birthday, a "fire watching" ceremony is held to foretell how business will go in the year to come. Come to watch Chinese opera being performed on the grounds from the afternoon to late into the night. On 2019, Chor Soo Kong's birthday falls on February 9, and the festivities take place from 7am to 11pm. For more on the Snake Temple, read this article: Penang Snake Temple. The Hokkien Chinese in Penang have their own grandiose Chinese New Year Bash on the Weld Quay's Chew Jetty – Thni Kong Seh, also known as the Pai Ti Kong Festival. The long tables groaning with food, and the sugarcane stalks that decorate every table and every household, commemorate the Hokkiens' escape from invading forces by their hiding in a field of sugarcane. Come midnight, prayers are offered to the Jade Emperor God, with sacrifices of food, liquor, and sugarcane stalks. For 2019, the festivities take place on February 12, 7pm to 12 midnight. Known as the Chinese equivalent of Valentine's Day, Chap Goh Meh is celebrated on the fifteenth night of the Chinese New Year. As the full moon shines, marriageable young ladies will go to the Penang Esplanade to throw oranges into the sea, all while wishing for a suitable husband. Street food, games and fireworks fill the air. In Penang’s Bukit Tambun fishing village (location on Google Maps), the Teochew Chinese of Penang celebrate Chap Goh Meh with a parade of drummers winding through the local community houses and temples. The parade starts at the jetty, and ends at Bukit Tambun’s historic old town. A number of hotels stand close to the history, culture, and shopping destinations within Georgetown, where a large number of Chinese New Year festivities will take place. Backpackers will appreciate the budget picks along Love Lane and Lebuh Chulia, while business and luxury travelers will like the higher-end establishments like the Eastern & Oriental. Compare rates on Penang hotels, Malaysia. Read about transportation options and getting around Penang, particularly your choice of buses in Penang.